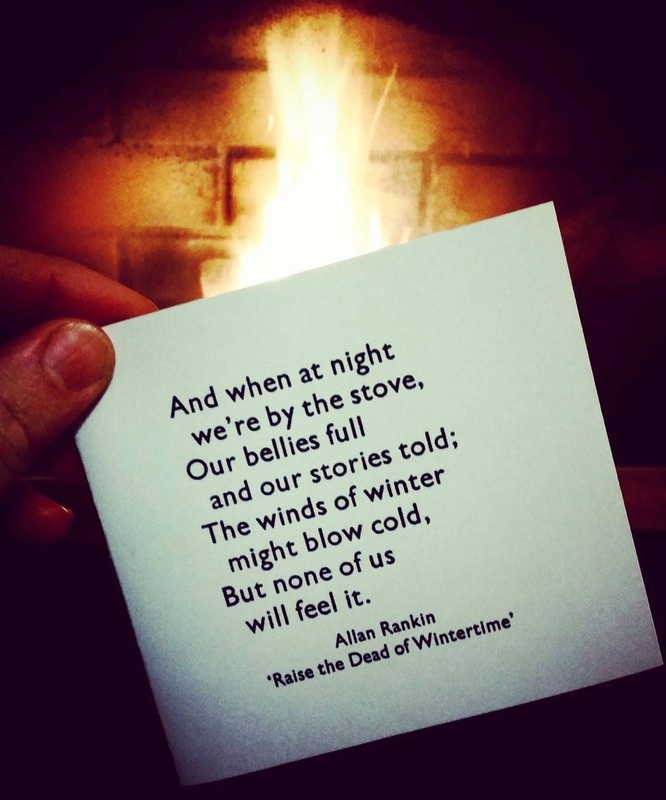 "And when at night we're by the stove..."
Longtime readers will know of my great affection for Allan Rankin’s song Raise the Dead of Wintertime, a love that last bore public fruit when I used it to introduce my “Walking for Free” talk at Reboot in 2008 in Copenhagen. The song is timeless; like Ron Hynes’ Sonny’s Dream, it transcends regular space and time and feels like an inviolable aspect of the Island’s cultural identity. But none of us will feel it. Those words, even though they speak to the ways of an earlier day, are so helpful to the soul on a cold Island winter night still. I asked Allan if he’d be willing to allow me to set and print the verse on cards, and he quickly and generously agreed. As usual when printing with a limited repertoire of typefaces it took some figuring to find the best way of rendering the verse in print: I wanted to print a square card, but the lines were too long for that, and so I compromised and wrapped them under each other, deciding on 18 point Gill Sans (from M&H Type Foundry in San Francisco, also used for the 2010 card) for the body and 12 point of the same face for the credit. Lacking highfalutin paper in the cupboard, I used commodity Staples-brand white card stock to print on. I printed 30 cards, and mailed them out to a random assortment of friends and family (if you didn’t receive one, don’t despair; we’re still friends). Nothing gives me more pleasure than seeing work I print enter into the lives of others upon arrival, and there was no better example of this than the photo that Sarah Bennetto O’Brien posted on her Instagram. It’s doubly appropriate that Sarah embraced the spirit of the card, as there is perhaps no more enthusiastic practioner of the belly-filling arts on Prince Edward Island working today. Written December 23, 2016 at 4:35 p.m.